Yes, you're remembering correctly: Robin did write a brief review of Rose Amazone when it was launched in 2014 as a flanker to Hermès 's 1974 classic Amazone. Rose Amazone was developed by Jean-Claude Ellena, Hermès's in-house perfumer at the time, as a modern interpretation of Amazone: "a sparkling, tangy and tender perfume, brightened by citrus fruits, currants and raspberries." The idea of a young and fruity flanker was already a cliché in 2014, and I somehow never got around to trying Rose Amazone. Three years later, we're swamped in even more new releases and flankers and flankers of flankers every month, and I can't keep up. Maybe that's why I stopped into an Hermès fragrance boutique, hoping to clear my mind, try Galop again and revisit my old favorite 24, Faubourg. While I was there, I caught sight of Rose Amazone and decided to give it a try after all this time. I liked it a lot (more than Robin did, apparently!) and I'd like to purchase a full bottle once I use up my sample vial. To me, Rose Amazone is an ideal balance of sweet and sour, beginning with a very mouth-puckering grapefruit top note and moving into a tart center of black currant buds and rhubarb. Its sweetness comes from raspberry and a wisp of rose concealed deeper in the heart. The base is a sheer woody chypre, but it's more transparent and yes, more contemporary than Amazone's 1970s mossy-chypre structure. 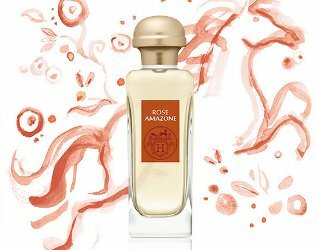 Rose Amazone probably wouldn't be considered a masterpiece of perfumery: it doesn't have much depth or any surprising harmonies, but it's radiant and natural-smelling, and it makes me smile. For comparison, it feels like a fruitier cousin to Ellena's Rose Ikebana (an earlier creation for Hèrmes) and its currant-and-rose theme echoes the composition of Diptyque's niche classic L'Ombre Dans L'Eau, which I've been wearing for more than a decade. For all these reasons, I'm not surprised that I like Rose Amazone; I just can't figure out how I went so long without giving it a try. Hermès Rose Amazone is available in 100 ml Eau de Toilette ($155). Black currant bud or rhubarb sound very tempting. I haven’t tried Rose Amazone before, would you consider it as more feminine, Jessica? Or is it perfectly unisex? Oops, meant to comment here! Need more coffee. L, I think it would work very well for men, despite its name! The floral aspect is *very* subtle — it’s much more of a citrus and currant scent. How does this compare to YSL In Love Again? To my nose, ILA is a younger, less formal sister to Rose Ikabena. I’m so glad you reviewed this Jessica! I love those notes, so I’ve been re reading reviews of it. I love the rhubarb in Rhubarb Escalarte. You’ve encouraged me to order a sample. I will have to try this one on my next visit to the Hermès parfumerie! I have a partial bottle of the original Amazone but don’t wear it very often. I suspect I might find this lighter contemporary twist on it more wearable. Side note: Black currant bud absolute smells very little like currants and very much like cat pee. It needs to be used in minute quantities. Even after diluting it to 10 percent I have to brace myself before I open the bottle and take a whiff. As a lover of the original, I found this one quite enjoyable and office-appropriate. Not enough for FB, I’m afraid. I also have a stash of the vintage so I’m set for 20 (or so) years.